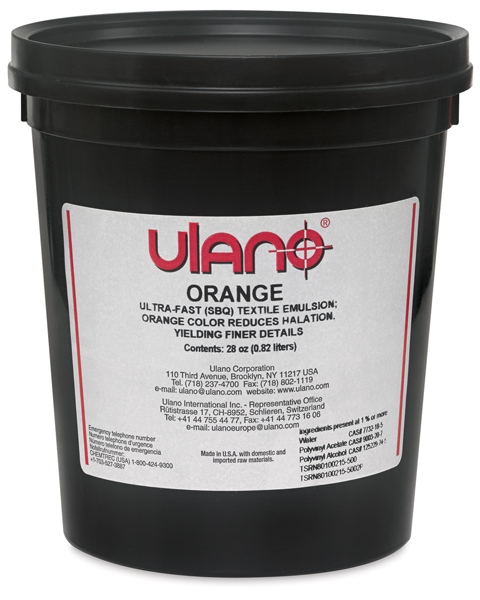 Specially formulated for sportswear printing, Ulano Orange is a ready-to-use SBQ-photopolymer direct emulsion. Its high viscosity makes it a good choice for mesh fabric and improves control when hand-coating screens, while its high solid content makes for faster drying and better mesh bridging, especially on coarse mesh. Light scattering is reduced due to Ulano Orange’s high-contrast color. It resists plastisols, most wash-up solvents, and most waterbased textile inks. Convenient for shops with a high stencil output because of its reduced stencil making time, and for printers with weak light sources because of its fast exposure speed, Orange-made stencils are extremely durable and won’t become sticky under humid conditions. 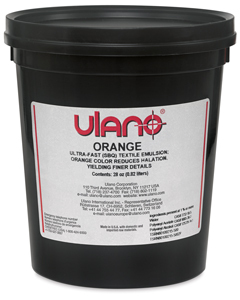 Ulano Orange has a shelf life of one year if unopened and stored at 70°F. ® Ulano is a registered trademark.™ Orange is a trademark.